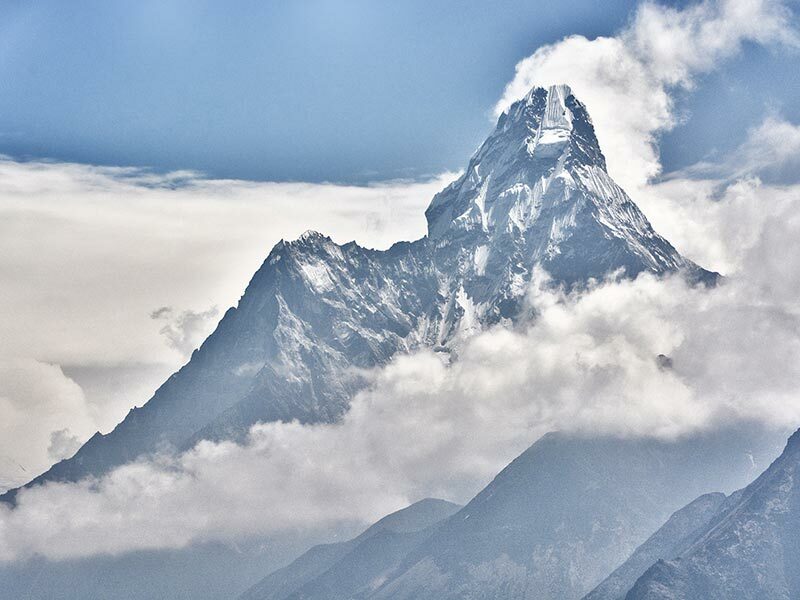 Showcasing some of the world’s most dramatic landscapes, Nepal is home to ten of the highest mountain peaks. The renowned Mount Everest, is the highest of them all at 8848 metres. Nepal is a country of contrasts. Showcasing spectacular natural riches with a vibrant culture and sense of history. 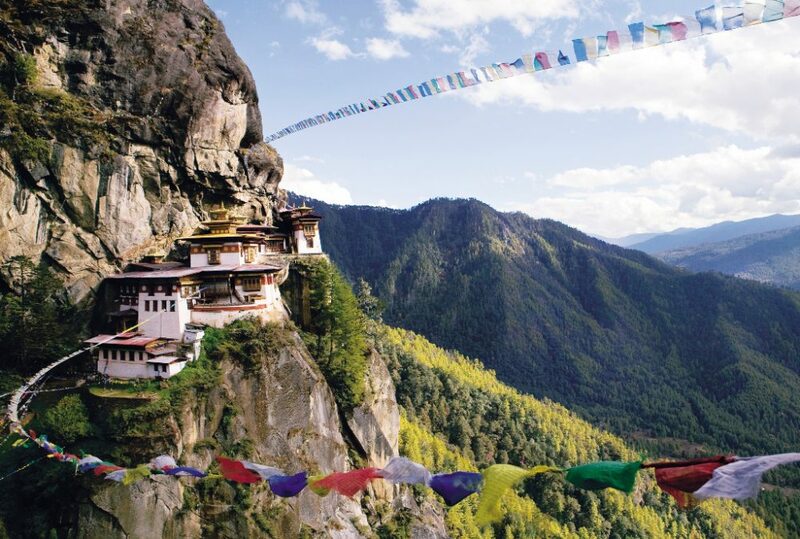 A spiritual destination, Nepal is known for its picturesque monasteries perched on stunning cliff tops. It is also the birthplace of Lord Buddha. A rugged mountain kingdom, stretching over the Himalaya Mountains, Nepal offers an astonishingly diverse array of attractions and landscapes. With its vast range of altitudes, it is home to an incredible variety of plant and animal species, including more than 300 species of orchid. And with over 800 bird varieties, it accounts for almost 10% of the world’s avian species. Adventure tourism in Nepal dates back to the early attempts to scale the world’s highest peaks. It has come a long way since. While trekking, mountaineering and game viewing have long been popular, an entire range of adventure possibilities have erupted. 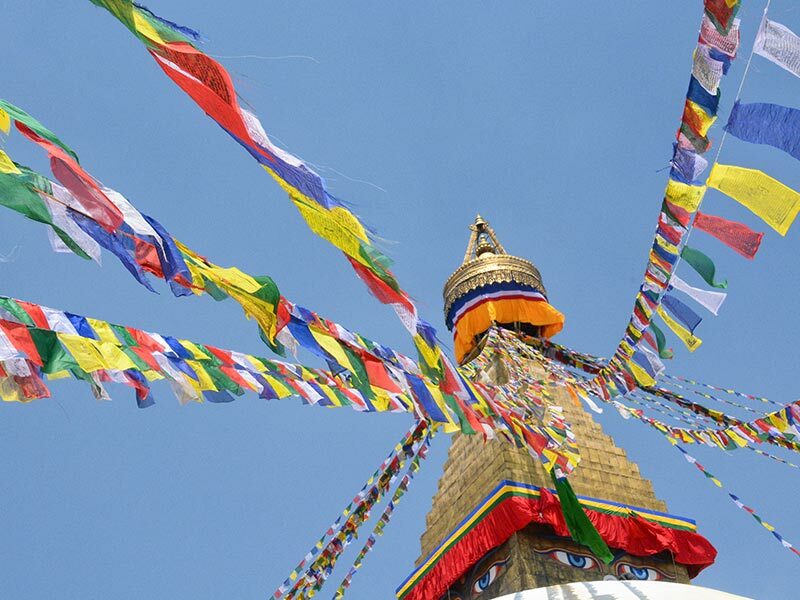 Epic offers travellers the opportunity to experience Nepal and the magnificent Himalayas. 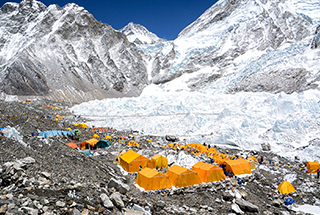 Trek to Everest Base Camp with us – an epic journey and unforgettable life experience. On 2 April, Brad Horn embarked on an expedition to climb Mount Everest with a team from Adventure Consultants (New Zealand). 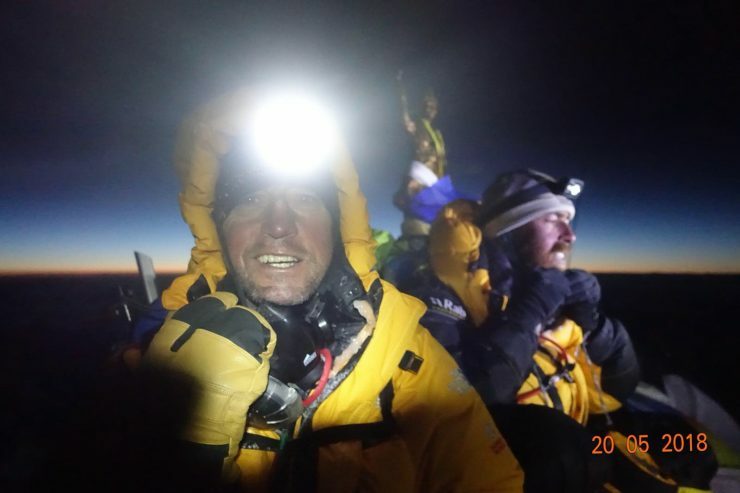 At sunrise on May 19th, Brad and the AC team stood on the summit of Mount Everest, the highest mountain in the world at 8848 metres. 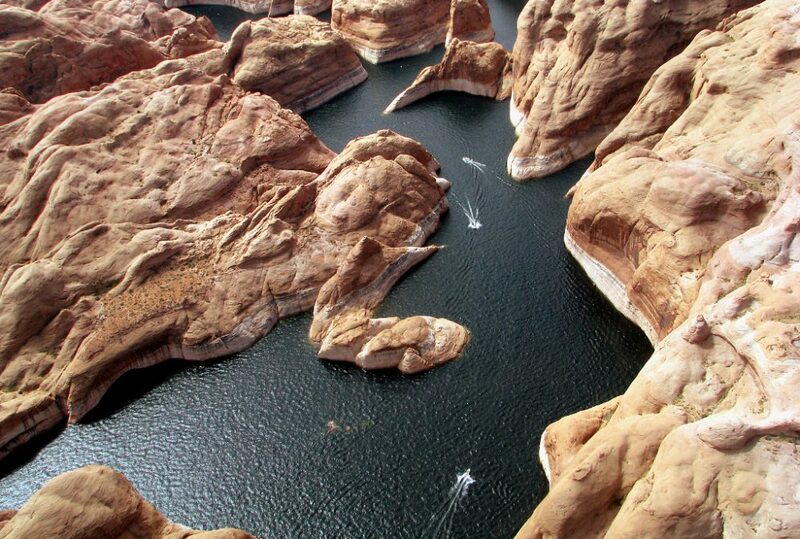 Read about this truly epic journey on the Epic Blog. Giving Back – For many years Brad and Epic have supported the indigenous charity Yalari, founded by an old school mate, Waverly Stanley. Yalari is all about the education of indigenous Australians and it is a charity that is changing lives. Brad’s Everest fundraising efforts raised over $12,000. Outside of Australia, Brad supported The Juniper Fund. This is a U.S based charity (with 501C3 status) that provides assistance to individuals, families and communities in underserved countries adversely impacted by their work for the mountain-based adventure industry. Its efforts are currently focussed on Nepal and Brad’s wish was for some benefit to flow through locally. Thank you to everyone who supported Brad’s climbing expedition by donating to his chosen charities. 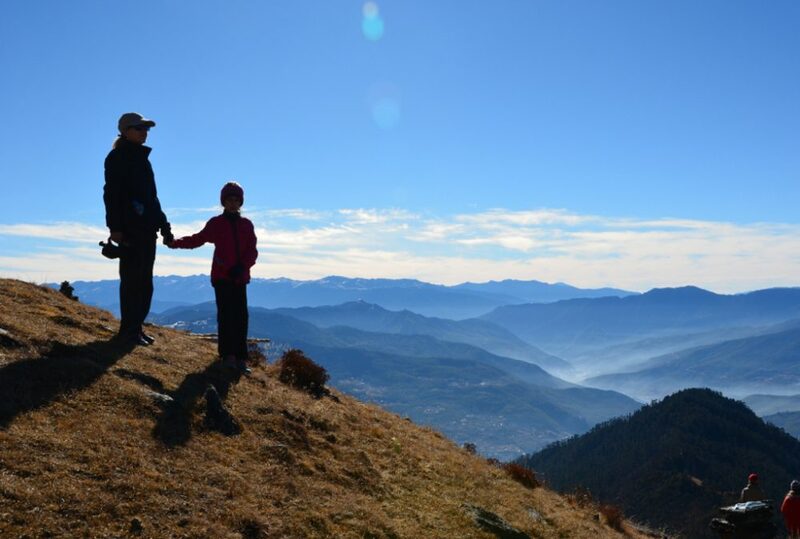 In April, 15 year old Ella Horn is heading off on a Everest Base Camp trek with her father Brad Horn. She will be fundraising for The Juniper Fund , a not-for- profit organisation set up specifically to provide support to these families. …The mountaineering industry in the Himalayas is built on the support of local staff. Their jobs carry great risk as they assist climbers to scale the world’s highest peaks. “I am 15 years old in Grade 10 at St Peters Lutheran College in Brisbane. It is a great privilege to be afforded the opportunity to trek to Base Camp so I want to make the most of it by raising money and awareness for The Juniper Fund. 100% of all donations will go to the Fund. 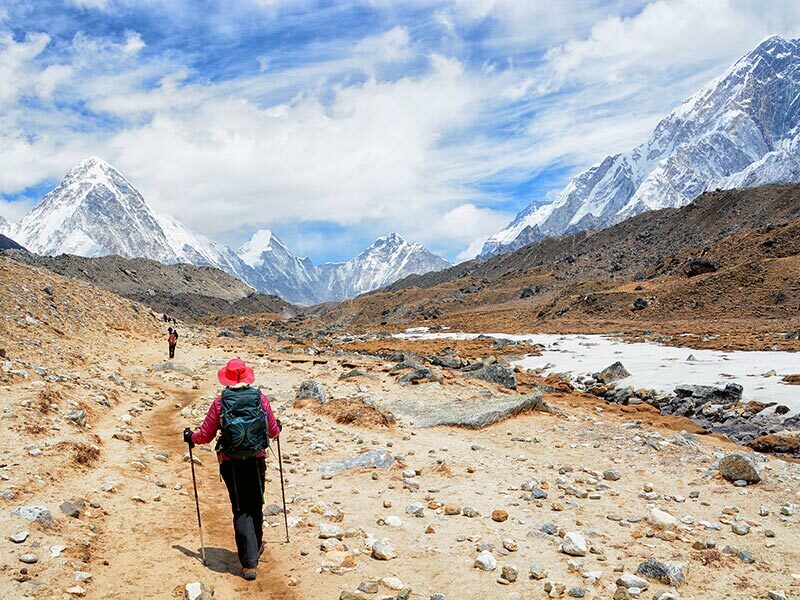 Join us on a privately guided trek to Everest Base Camp and experience this spectacular wilderness first hand. Upon arrival in Kathmandu, you are met and transferred to Yak n Yeti Hotel. 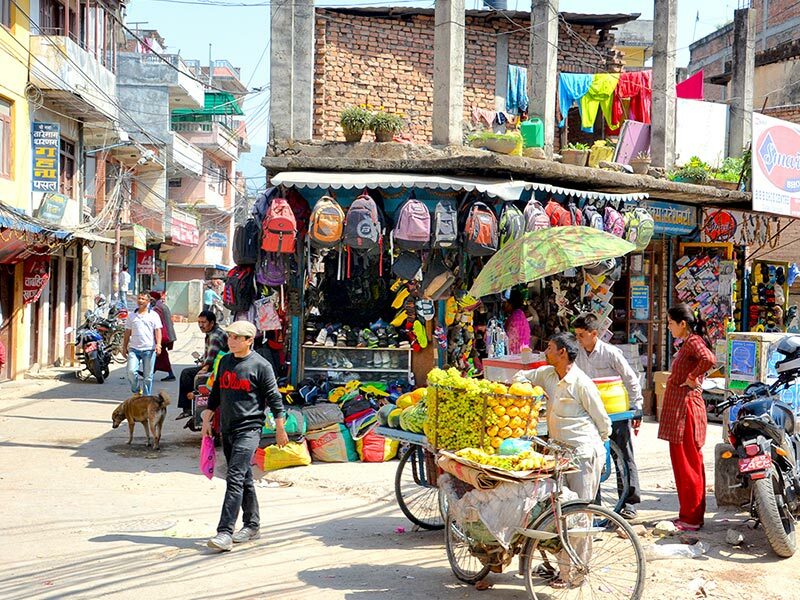 As the largest city in the country, Kathmandu feels like another developing-world city rushing into a modern era of concrete and traffic pollution. Take a walk in the backstreets, however, and the capital’s amazing cultural and artistic heritage reveals itself in hidden temples overflowing with marigolds, courtyards full of drying chillis and rice, and tiny hobbit-sized workshops largely unchanged since the Middle Ages. This morning we will rise early and take a packed breakfast to the domestic terminal of Kathmandu airport for an early morning flight to Lukla. 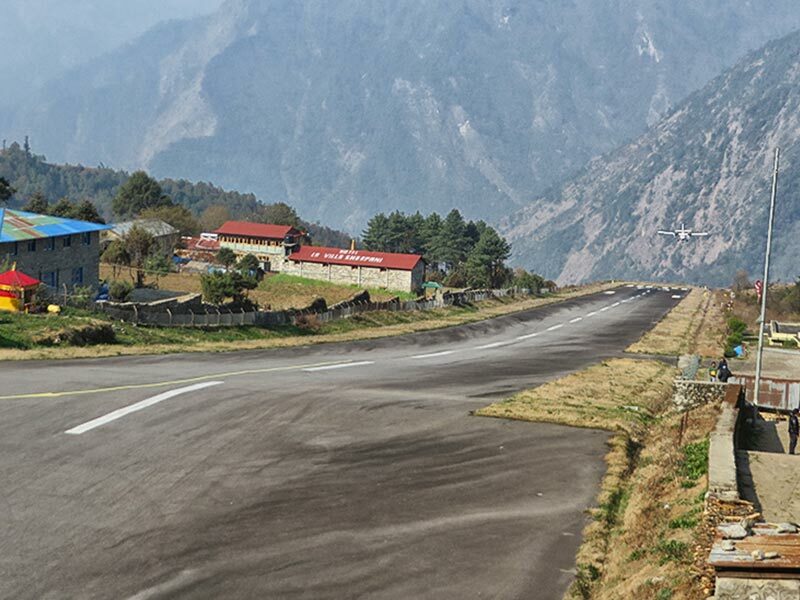 After a 40-minute flight above the breathtaking green and white mountains, we reach the Tenzing-Hillary Airport at Lukla. This is one of the most beautiful air routes in the world culminating in a dramatic landing on a hillside surrounded by high mountains peaks. Upon arrival at Lukla, we start our trek through to Monjo. Today’s hike will take roughly 4 to 5 hours. It is intentionally short so that our bodies start a gradual acclimatisation to the altitude. Upon arrival in Monjo, we check into our hotel and enjoy some time to relax. 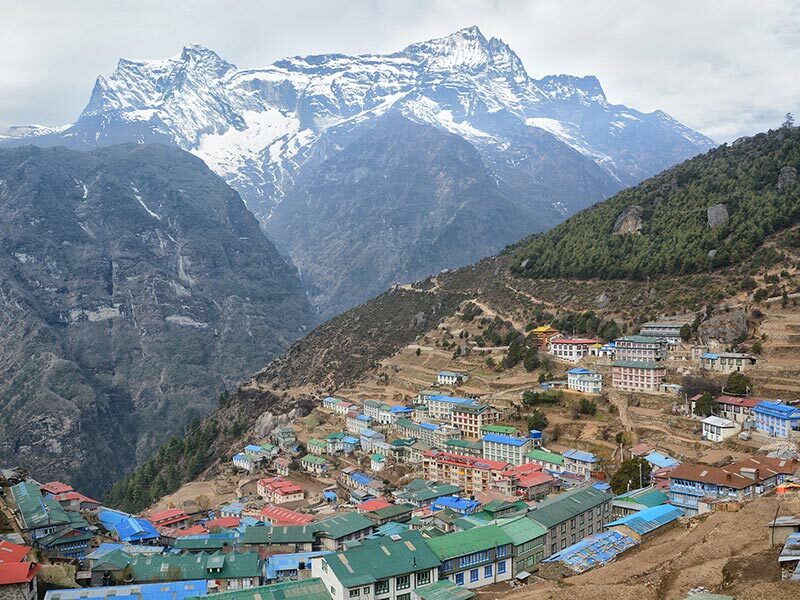 Today we trek to Namche Bazaar. We are on the trail for upward of 5-6 hours with an elevation gain of just over 800 metres. It is a beautiful yet somewhat demanding day and given the increase in altitude, it is important that we take it easy and stay hydrated. Upon arrival in Namche Bazaar, we check into Hotel Namche, where we stay for two nights. Today we acclimatise with a morning walk on the Khunde Loop via the Everest View Hotel. Situated at 3,880 m it is the highest located hotel in the world and commands a spectacular view of Mt. Everest. 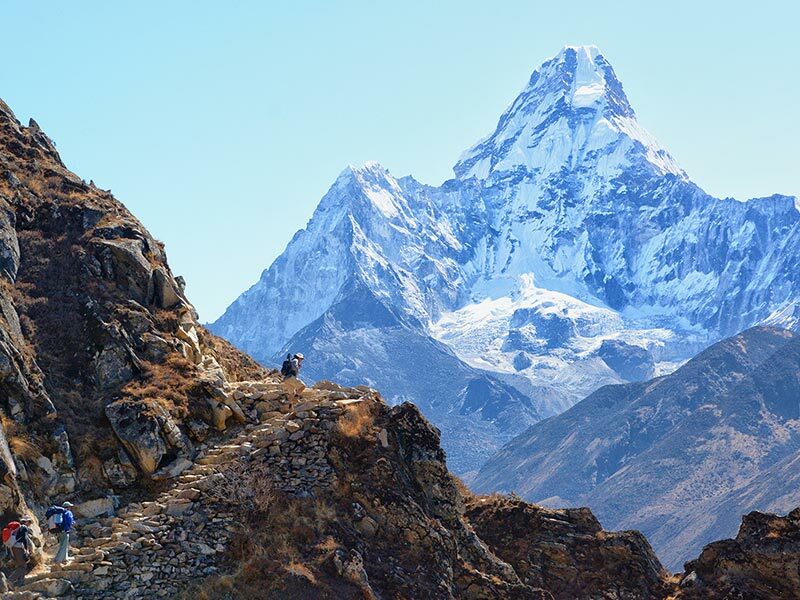 In addition to Everest, the hotel offers views of many other high and awe-inspiring peaks including Ama Dablam (6,856 m). 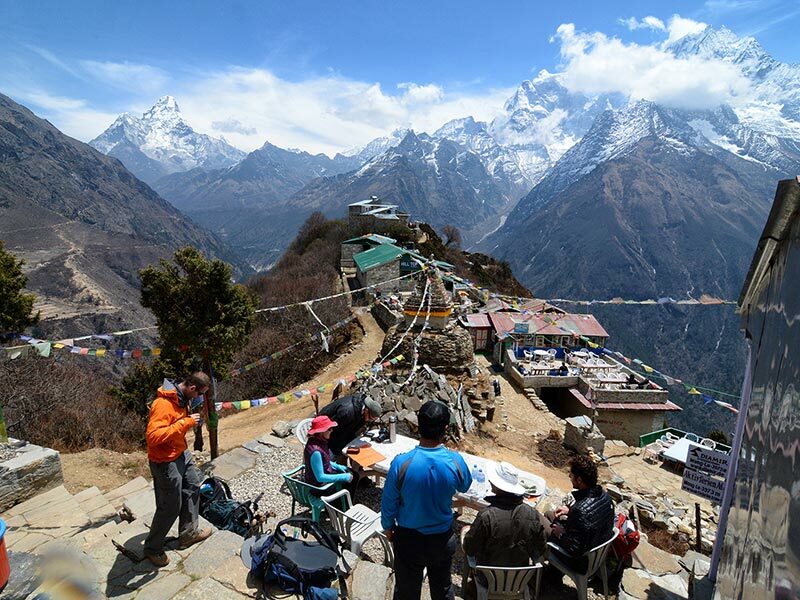 We return to Namche for lunch and a relaxing afternoon to aid our acclimatisation. Today we will pass through the village of Tengboche (3,865 m) on our way to Deboche (3,710 m). We will spend roughly 5-6 hours on the trail. 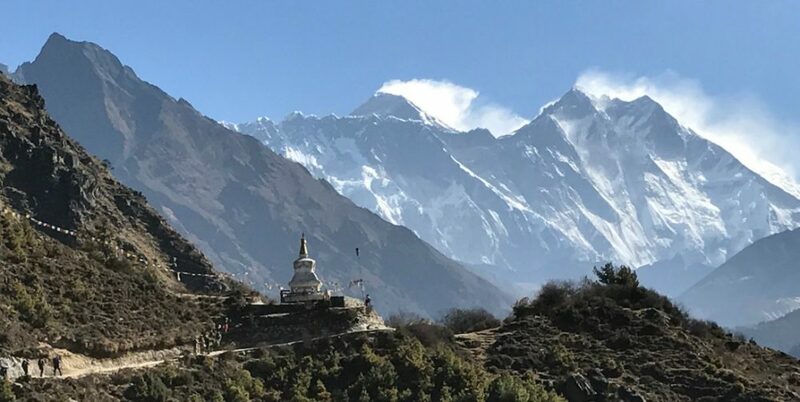 Tengboche is the cultural and religious centre of the Khumbu, from where the views are spectacular – the jagged peaks of Thamserku and Kangtega stand to our south and Everest, Lhotse, Nuptse and Ama Dablam are visible to the north. From Tengboche, we have a short trek to Deboche. Upon arrival we check into Rivendell Lodge where we stay for one night. Again today we spend roughly another 5-6 hours on the trail through to Dingboche. With an altitude gain of over 500 metres, we will take it slowly to assist with our acclimatisation. The next two nights are spent acclimatising in Dingboche, hiking around the village and surrounds. We will stay at Moonlight Guesthouse. This morning we set off on the 4-5 hour trek to Lobuche. 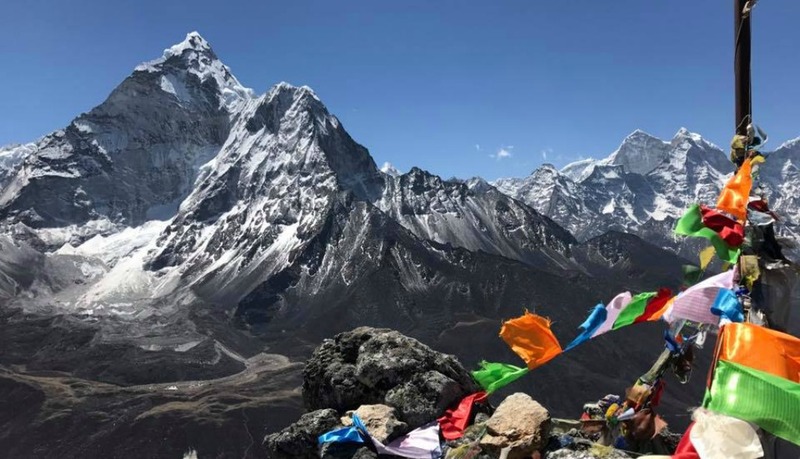 Situated on the flank of an old lateral moraine of the Khumbu Glacier, as the trail winds through the high tundra and glacial moraine to reach Gorak Shep (5,158 m), Lobuche is the last inhabited area before Everest Base Camp. After resting in Pheriche we should be in good form for the walk. There is a considerable increase in altitude as Lobuche is over 600 m higher than Pheriche. Upon arrival in Lobuche, we check into Eco Lodge. 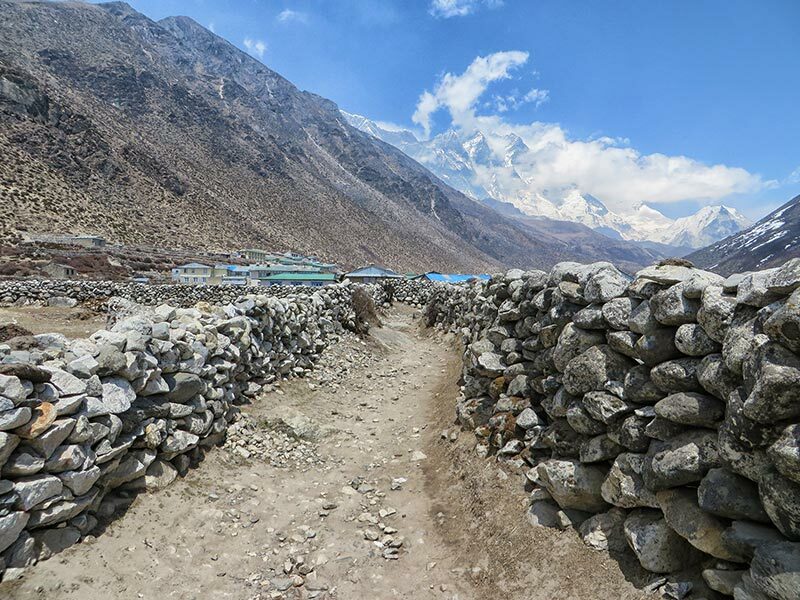 The trail today leads us further up the Khumbu Glacier. It will take us roughly 3-3.5 hours to reach Gorak Shep. As we ascend higher, the environment becomes ever starker. That said, the scenery is strikingly beautiful. As we near Gorak Shep, we will find snow-capped mountains looming all around us including the top of the world – Mt Everest. Upon arrival at Gorak Shep, we check into the Yeti Resort. Today is the climax of our trip, as we climb Kala Patthar and head on to Base Camp. 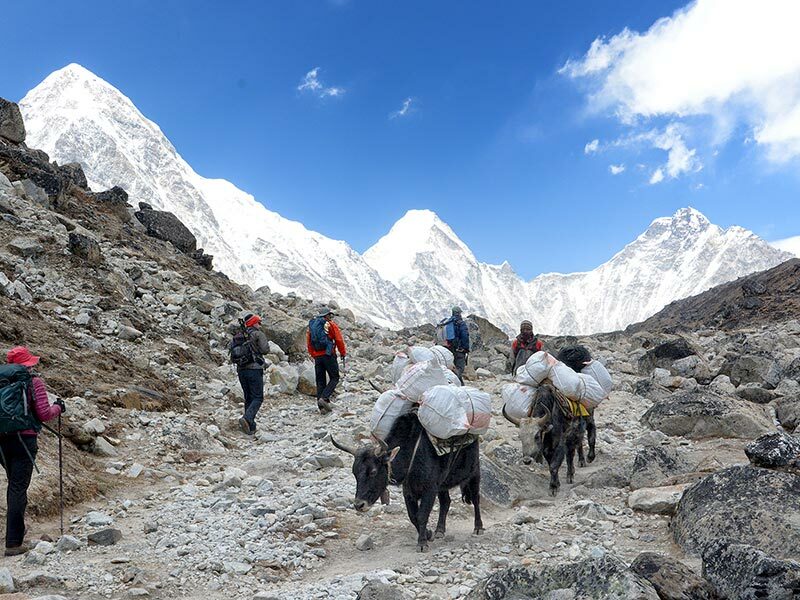 The ascent to Kala Patthar will take roughly 1.5-2 hours. From the top a stunning Himalayan panorama unfolds; this is truly one of the most majestic views in Nepal. 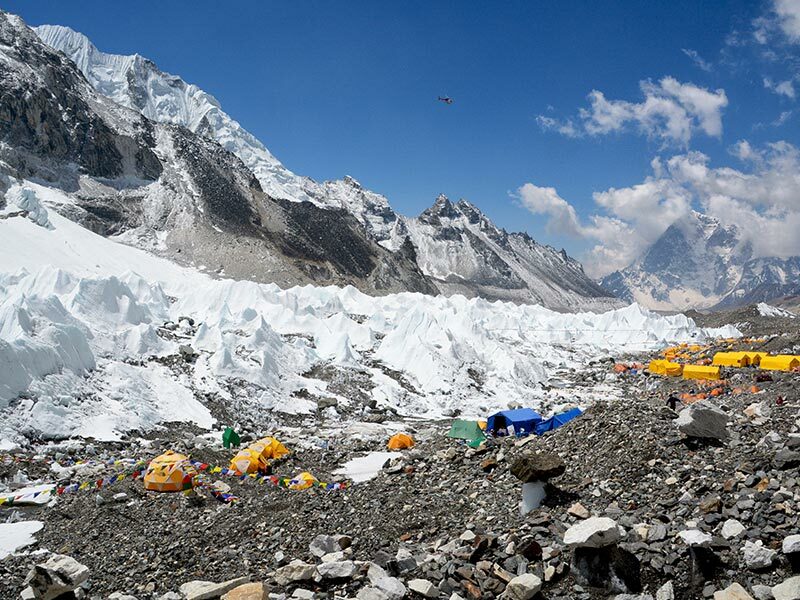 Whilst we are at Base Camp we have the opportunity to walk to the base of the Khumbu Icefall to get a closer view of the route that weaves its way through enormous jumbled ice. Today, we helicopter back to Kathmandu. We check-in to Yak n Yeti Hotel and the rest of the afternoon is at leisure. 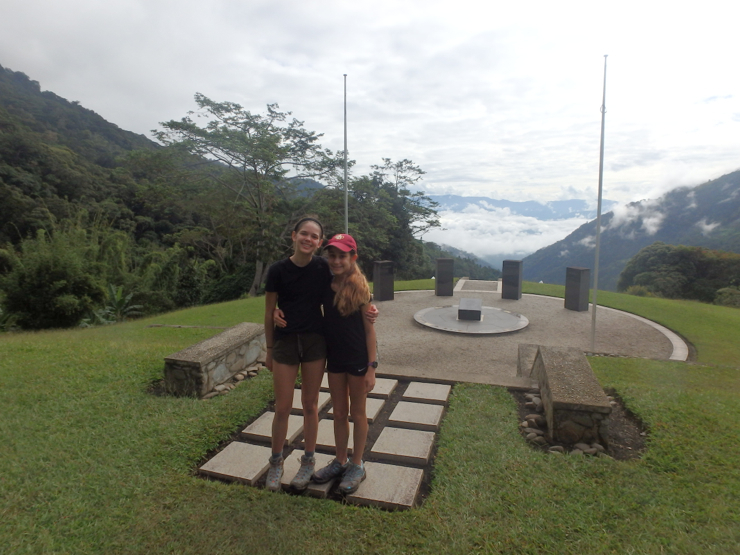 This evening we will enjoy a farewell dinner and no doubt recount the many stories from our adventure. Today we bid farewell to Nepal. After a leisurely morning, we are transferred to the airport where we check-in for our onward flights home. *Prices per person twin share subject to availability and change without notice. The mountaineering industry in the Himalayas is built on the support of local staff. Their jobs carry great risk as they assist climbers to scale the world’s highest peaks. On Mt Everest, for instance, a third of all deaths on the mountain are climbing support staff (guides, camp staff, porters etc.). In most cases these people are principal “bread winners” so when tragedy strikes it has a very deep flow on effect to family members left behind. The Juniper Fund , is a not-for- profit organisation set up specifically to provide support to these families. In April I will be climbing to Everest Base Camp with my Dad. I am 15 years old in Grade 10 at St Peters Lutheran College in Brisbane. It is a great privilege to be afforded the opportunity to trek to Base Camp so I want to make the most of it by raising money and awareness for the Juniper Fund. 100% of all donations will go to the Fund.